finished knit! and i blocked the shawls, but haven’t gotten photos yet. this one will be at the Grand Opening of the studio this sunday, if you care to stop by and check it out. it’s main color is rainbow chard light. raveled here. of course, i couldn’t resist putting it on my babe who is no longer a year old (the size it is), and it looked like a cute little tunic. and he didn’t want to take it off which warms a mom’s heart. some day i will write up the pattern! 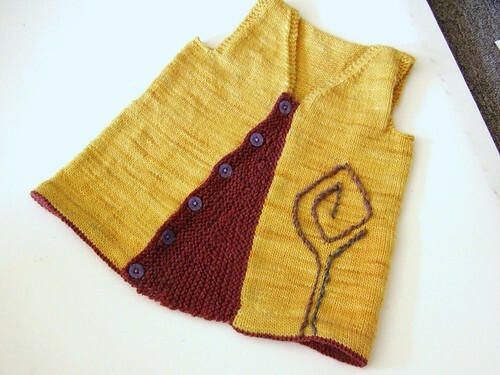 This entry was posted in cosyknitsliterally, dyeing, knitting, patterns by cosymakes. Bookmark the permalink. Yes pretty pretty please!! Dying to try this one!! And Cosy… all the best to you and the grand opening. I so wish I could be there to help you celebrate! I love this! The perfect little jumper. Congrats on the Grand Opening! !